It was blustery cold outside today. Great time to spend inside sewing, right? This is what my embroidery machine looked like this afternoon. The pile of jackets on the left is done, and the stack on the right was my "still to be done" pile. These fleece jackets had a pocket on the left side, so I embroidered the logo on right side instead. Done and To Be Done piles. It was a little odd to mark the fabric as my Embroider's Buddy placement tool is marked for embroidery on the left side. I just flipped it over and copied the markings to the back. I was able to get all the jackets finished. Yea! 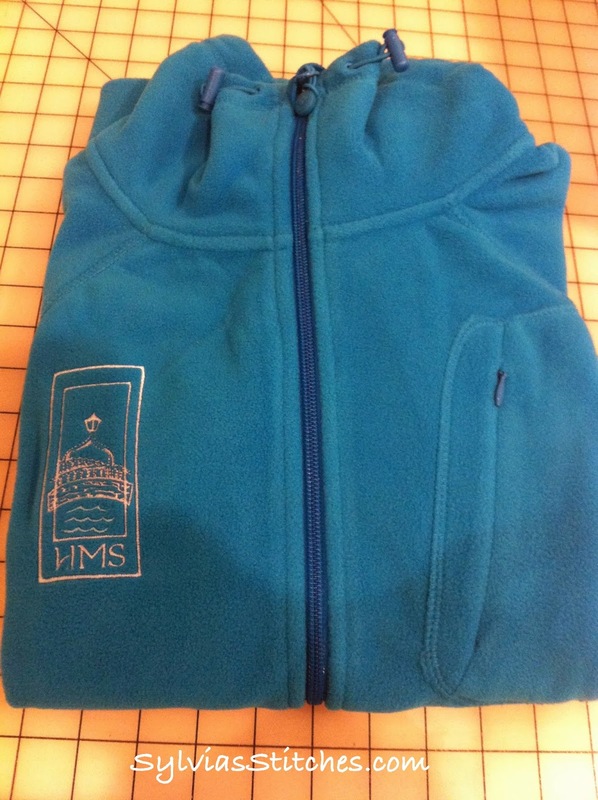 Sample of a completed jacket. Hope you had some time to stitch this weekend as well.